Hello I’m Sally Graves and I’m on a mission to travel the country and seek stories of Compassion for the Earth, Animals and People. I want to INSPIRE people to make more Compassionate Choices! On February 6th I will be 44 years old. Every year I challenge myself in a big way. When I turned 40 I gave up sugar. At 42 I veganized my entire wardrobe and replaced it with all organic, plant based fibers like cotton, linen, hemp and lyocell. This year my Spirit wants me to do something even bigger, braver, and bolder and to do it for others instead of myself. I have been called into a year of SERVICE. I am embarking on a year long journey to travel the United States in my 1994 Chevy GTO Van and seek Stories of Compassion so that I can share them with all of you via a YouTube channel. My spiritual practice teaches that what we focus on persists. Thus, I have decided to FOCUS ON THE GOOD. Despite all the heartache and hardships in our world, I know that there are so many good people, doing so many good things. These are not the things you usually see on CNN or Fox. I want to tip that balance. I want to provide a beacon of light, of hope, a reminder to everyone that all of our lives have meaning. My intention is to seek out individuals, companies and organizations that are making Compassionate Choices for the EARTH, ANIMALS AND PEOPLE. My core philosophies will revolve around the concepts of SUSTAINABILITY, VEGANISM, AND MINIMALISM. Speaking of minimalism, I’ve given away almost everything I own. With the incredible assistance of my DAD (thank you Dad, I love you so much, thank you for believing in me), I purchased a VAN and I plan to live in that van while I travel the US for a year. So I have the van and I’ve got almost everything I need in it. The van was built by an awesome Australian couple, (you’ll have to watch my YouTube channel to hear the full story), and it’s been fitted to go off grid. That means that with the two 100w solar panels on the roof, I can travel anywhere and still have electricity. My van includes a fridge, a sink, a shower, a potty, a bed, a heater, a Coleman stove, interior lights and the ability to charge my phone and devices. I literally have everything I need, well except for some gas money and a few electronic items so that I can make interesting videos. This is where you come in. I was able to save up a little chunk of money but I had to pay off a debt and now I’m short. The good news is that I don’t need much. In fact, this past year I’ve proven to myself that I can live and thrive and still be incredibly happy on less than $20k a year. If I can do that in NYC then I can certainly get by on the same amount without having to pay rent and utilities and endure the harsh expenses of living in the city. My health coaching degree is from the Institute of Integrative Nutrition. My passion for helping people live a vibrant healthy life is going on over 10 years now. While I’m a great coach, as my clients will attest, I’ve not been very successful in tooting my own horn well enough in order to get a steady stream of clients. Well that’s changing and I’m excited to use my Compassion Van platform to give online classes and work with clients remotely. So I do plan to work. Mostly though, I plan to work for YOU! I hope that each day I can inspire you to see the GOOD IN THE WORLD! To show you that it starts with just one person and that we can all make a difference in the world, for the earth, the animals and for people. I invite you to join me on my journey. Help me get the wheels turning. I know that I can live on $1,000 a month. That will allow me to travel for a year, pay my bills and eat good vegan food. Don’t believe me? Just watch I’ll show you how. I plan to document my journey via a YouTube channel, with both edited and non edited videos. I will be doing live streams, chats, and talking to as many strangers as possible about compassion. My journey has already begun. I’ve scheduled interviews, which I’m calling “Compassion Conversations” with folks in Maine, Massachusetts, New York, New Jersey, Maryland, Georgia, and Louisiana! That’s just the beginning! I plan to be very very busy. In case you’re worried about me and you think this is a terribly dangerous idea, please don’t fret. 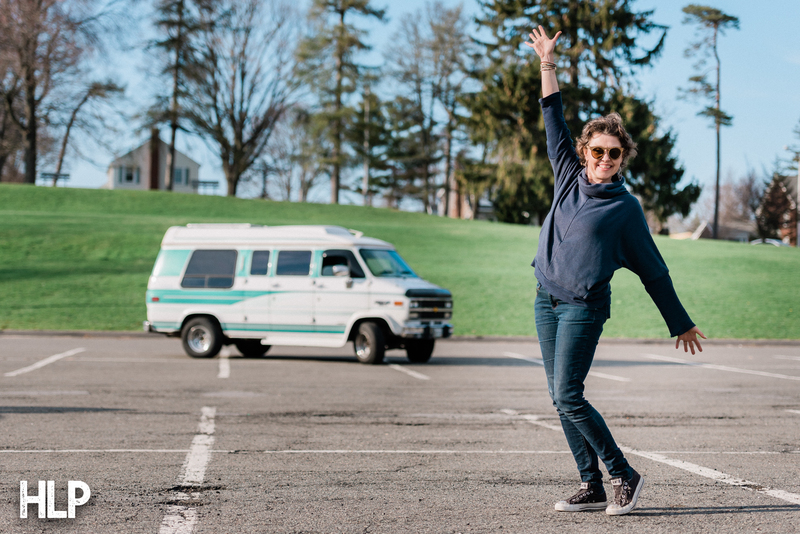 There are lots of people, including solo women, who are living the #VANLIFE. If you’re not familiar, Google it, or type it into YouTube. In 2015 it was estimated to be a $500 million dollar industry and projected to be a $5 BILLION industry by 2020! I’m also not the first person to go across country on a MISSION TRIP. I am inspired by Kirstin Lajeunesse who ate at every vegan restaurant in the country (in a van that looks a lot like mine) and Rob Greenfield who biked across country eating out of dumpsters to shine a light on food waste, and by Leon Logothetis who traveled the world without money relying on the kindness of strangers for all his needs. I know this is possible and I’m more excited about it than I have been for anything in my life. In addition to seeking stories, doing interviews, and making videos, I plan to spend time in nature and do lots of writing. Don’t worry, I’m taking you to the woods with me! You’ll get to experience beauty, tranquility and amazement without leaving your desk! Oh and sunrises and sunsets, lots of sunrises and sunsets! I ask that you join me on my journey. To be a part of it by watching my YouTube channel, by contributing to my Compassion Campaign, and by sharing this with everyone you know! Here’s my BIG BIG DREAM….If I can get funding over my current goal I will use it to create my own Compassion Projects, by collaborating with organizations along the way or making paper bag lunches and handing them out to the homeless! I would love to pay someone to do my video editing for me too. Most of the successful YouTubers do not do it alone. My focus is not on becoming an amazing video editor and while I enjoy the process, I’m not that good yet. With an experienced editor I can provide even better content to my viewers. My even bigger dream would be to turn it into a show much like Mike Rowe’s “Return the Favor.” I recently discovered this Facebook Watch show and I’m drooling…perhaps someday I will get my own show! 1. PLEASE, go to YouTube.com and SUBSCRIBE TO MY CHANNEL: Http://YouTube.com/compassionvan Even if you don’t plan to watch, simply boosting my subscriber count will help tremendously. 2. Ask your friends and family to Subscribe too! 3. Help me spread the word by sharing this campaign! Sharing is caring. Even if you don’t contribute, someone you know may be excited to do so! Please add me on YouTube, Instagram, Facebook, Twitter and Pinterest. Visit http://www.compassionvan.com to read my blog and for links to all the above. Thank you all so much for being a part of my Compassion Van Tour – I’ll see you out on the road!! P.s. Here’s my short list of equipment that I still need to create content and make my life a little easier. I’m happy to accept donations of used items from this list.